Sugarcane is a sub-tropical and tropical crop that requires lots of sun and water. It has a stout, jointed and fibrous stalk, which can measure 2 to 6 meters in height. Beneath its hard outer layer, there is nectarean juice. However the juice cannot be had as it is. After removing the hard outer covering, the inner white stem will have to be squeezed hard to yield the juice. 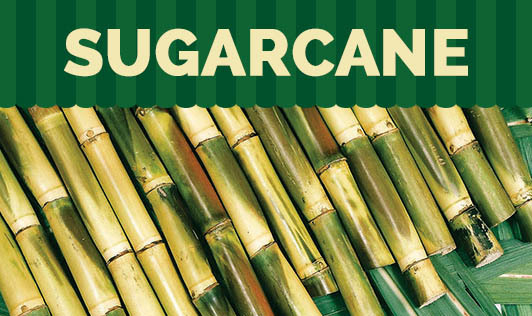 Sugarcane is used in the production of sugar, rum, soda, molasses, and ethanol that is used in fuel. Sugarcane is a good source of phosphorous and calcium. Sugarcane juice is a high-energy drink that is natural, sweet and a healthy alternative for other sugary beverages. Sugarcane provides glucose to the body, hence considered to be one of the best sources of energy, supplying instant energy to working muscles and maximizing performance in sports and endurance. If you have been exposed to heat and physical activity for too long, drink sugarcane juice. It will help hydrate the body quickly. Sugarcane juice is an excellent substitute for aerated drinks and cola. Sugarcane juice has been found to be good for those who are suffering from febrile disorders and burning micturition (passing urine). Cane juice also helps in the smooth functioning of kidneys and keeps the urinary flow clear. Sugarcane is also good for digestion, as it can effectively work as a mild laxative because of its high potassium content. Fact: Sugarcane is low on glycemic index and has no simple sugar. It can be enjoyed by diabetics without any fear. However, the intake should still be limited for people suffering from diabetes. Fact: Fluids in general may help in recovery; the popular belief that sugarcane juice is the best for recovery from jaundice is not true. Raw sugarcane: chewed to extract the juice. Sugarcane juice: a combination of fresh juice with a touch of lemon and ice makes a popular drink. Mint leaves extract; ginger or pepper powder can also be added to get various flavours. Jaggery: a solidified molasses, known as Gur or Gud in India, traditionally produced by evaporating juice to make a thick sludge and then cooling and molding it. It is used as sweetener in cooking traditional sweets and desserts. Syrup: a traditional sweetener in soft drinks. Chikkis: can be used with roasted groundnuts, sesame seeds or cashew nuts.